It’s Monday and traditionally, the time has come to introduce our Free App Poll winner to our readers: meet omNovia Web Conference Mobile! Being available in the productivity category in the Apple App Store for FREE, omNovia Web Conference Mobile is available in English, Chinese, Czech, Dutch, French, German, Italian, Japanese, Korean, Polish, Portuguese, Russian, Spanish, Swedish and Turkish Languages and provides best web conferencing and webinar experience yet available on mobile devices. 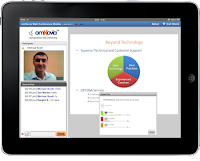 Offering the outstanding web conferencing with a rich media interface in an interactive, secure and customizable environment, omNovia enables some additional features such as: live voice, video, chat, polling, slide show, application sharing viewing, documents folder, eCurtain and more. Please note upon installation, you must launch this app from the browser based login page for which you receive a link via email from the webinar organizers. 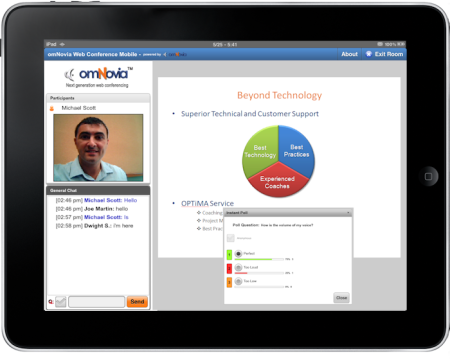 Also note that although the omNovia Web Conference Mobile app works on smart phones, it has been optimized for iPad with Wi-Fi too, providing even better webinar experience. So it turns out that the app is compatible with iPhone 3GS, iPhone 4, iPhone 4S, iPod touch (3rd generation), iPod touch (4th generation) and iPad running iOS 4.0 or later. This tool will definitely make your business relationships more successful and will never disappoint you and your partners. So go and get it now!